What is Pie Town like? Despite the cute art and theme, Pie Town is anything but a cute little game. At its core Pie Town is a dice placement game where your dice represent your workers. Each player starts with two workers on their own pie factory player board. Each round consists of the players placing their workers in their factory, or the common boards until every player has used all of their workers. In the factory the workers can upgrade the factory allowing them to store more fruit, bake more pies at one time, or hire more workers. In the common boards the workers can either harvest fruit equal to the number on the die, go to a convention to assign a new first player or change an ingredient of their secret recipe, or sell pies at the market. If that was all that the game was, it would be a basic worker placement game, but Pie Town takes it up a notch by adding in some extra levels of play. When each die is played it is possible that their level (number) will increase or decrease depending on the action they take. This can make your worker stronger or vulnerable to attacks. Attacks, you say? In a game about pies? Yes, I do say and yes in a game about pies. Certain actions (harvesting or market) leave your workers open to be spied on. If a higher level worker is placed on top of a lower level worker then they can do the action of that space in addition to spying on the player whose die they are on. When spying, the spy may look at a number of ingredients from the other player’s secret recipe. The number is determined by the difference between the die which is spying and the die that is being spied upon (ie a 5 worker is on top of a 4 worker then they get to see one secret ingredient). The secret recipe comes into play in a couple ways. During the game if you make your or another player’s secret recipe, you get more points for selling those pies at the market. After 9 rounds the game ends with the final bake-off where each player can gain points by correctly identifying each other player’s secret ingredients. The more correct ingredients known, the more points. Incorrect guesses do deduct points though. 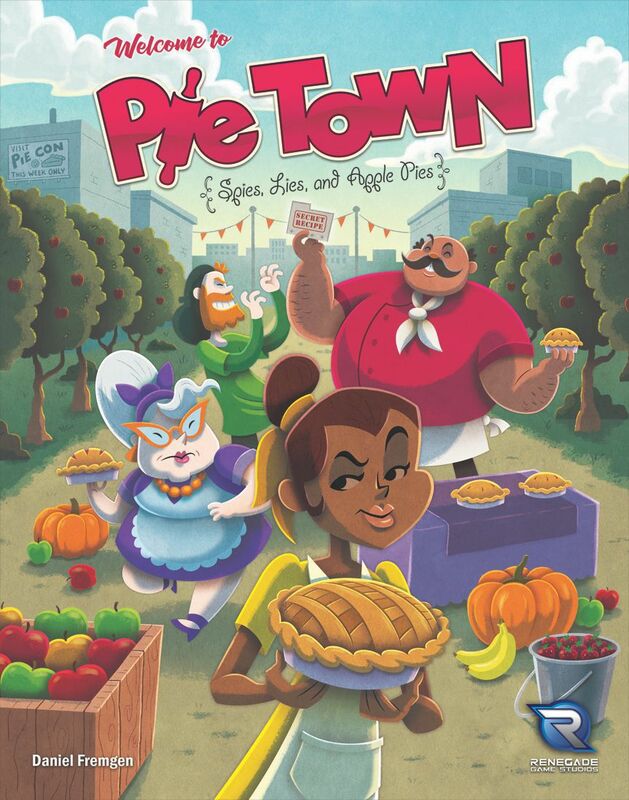 When I saw the box for Pie Town I wasn’t expecting a game that was as cutthroat as Pie Town is. Don’t get me wrong, it isn’t a vicious game and there aren’t a lot of take-that elements, but I didn’t expect any of that so the presence of those actions at all kind of threw me off. That being said, I really like what Pie Town does in a few different areas. One of my favorite things that it does is in the market area of the board. When you go to sell pies you can either sell one column (one type) of pies or the bottom row (one of each type). Timing when you sell pies is huge, because if you time it right you only sell your own pies, but if you get there too late you might be forced to sell an opponent’s pies giving them points as well. This might make you sell pies before it is ideal or push your luck and hope someone else sells your pies before the game ends. Another thing I like, and it seems like a little thing, is the option of choosing start player. When you send your worker to the convention you can choose the starting player for the next round instead of being forced to take it yourself. This can give you the strategic position you need to spy on your opinions, sell pies, etc. Overall Pie Town is a solid game that is easy to teach a play and also adds a bit more to the worker placement genre than what I have seen before. Pie Town has a decent amount going on, but with so few workers to do anything the complexity is pretty low. There are only a few actions that can be done with those workers too allowing for a quick pick-up of the game. Overall you can explain the game and get playing without much trouble at all.